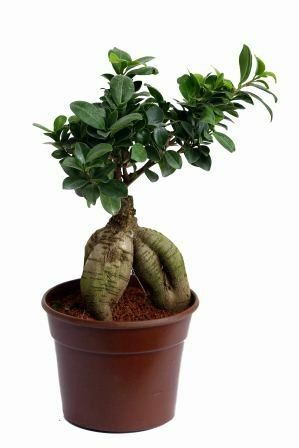 Grafted Ficus-Microcarpa 4 years old bonsai is a combination of two different plants, Ficus and Microcarpa, joint together to increase the overall strength. Attractively shaped and easy to maintain these bonsai are great for your home or office decor and also an ideal option for green gifts. Aside from the fact that these bonsai trees are very rare and beautiful to behold, they are scientifically proven as a great stress busters. There are different virtues or values that can be developed when growing a Bonsai such as patience, contentment, appreciation, gratefulness, creativity, and many others and of course they will add beauty and aesthetic to your life. Dimension: 5" x 5" x 7"
DO'S: 1.Keep them at a place which gets 3- 4 hours of daily sunlight. 2.DO the pruning of old leaves which turns yellow to avoid fungal attack. 3.DO check the coco peat before watering . Ideally water them every alternate days for roots to get optimal water supply. 4.Put manures every 6-8 months for better results. DON'TS: 1. DON'T repot these bonsais by yourself. It should be done by a plant doctor. 2. DON'T repot using regular soil ask our plant doctors for the right mix. 3.DON'T water it using glass or bottles. Spraying of water makes sure plant gets water from all sides. 4. Avoid temperature shock for better growth.